San Francisco Fishermans Wharf Restaurants - Go or Not? In an informal poll, 60% of our readers responded that they planned to eat at a Fisherman's Wharf restaurant. If a pollster asked San Francisco residents that question, they'd have a hard time finding anyone to say yes. San Franciscans aren't just being snobby about the touristy area: The restaurants at the wharf seldom make it onto anyone's list of best seafood restaurants in town. Like any area where dining establishments depend mostly on out-of-town visitors (who are not likely to become repeat diners), there's little emphasis on quality of food and service and more on getting people in the door. By now, you're probably wondering why Aunt Sophie, the barber next door and that guy at the office keep telling you that you just have to eat at Fisherman's Wharf. Those well-meaning friends and neighbors are probably just parroting what they've heard over the years. Should You Eat at Fisherman's Wharf? Maybe. Maybe not. If you're there and hungry, you may want to grab something from a sidewalk stand. If you can't bear the thought of going home and telling Aunt Sophie, your hairdresser or the mailman that you didn't eat at the spot they recommended, then you're probably going to eat there no matter what I say. 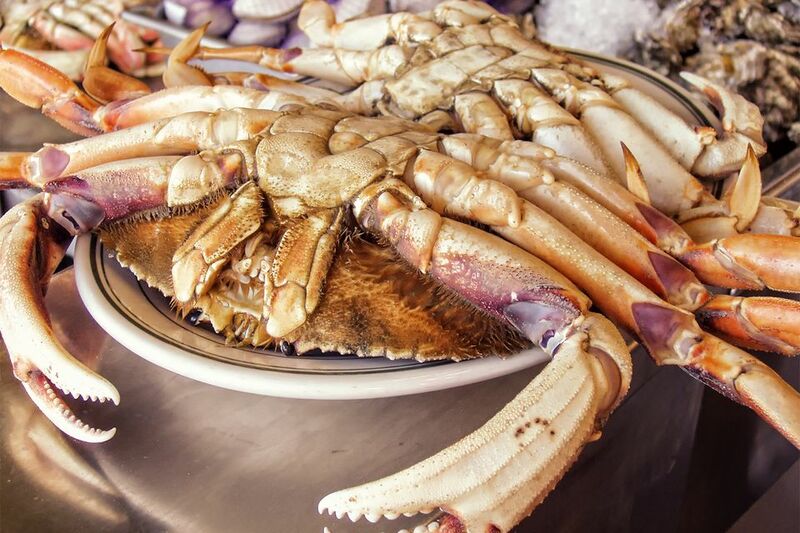 Dungeness crabs are big crabs with meaty claws and bodies and a fresh one is a real San Francisco treat. Crab season runs from November through June. More or less. Check this page to find out when it's open this year. If you're visiting July through October, the crab you order will have been frozen. I'd suggest skipping it when out of season because freezing compromises the texture, making it mushy. This short list of two are the best-rated at the wharf, but neither of them is the place to go if overpriced, mediocre food makes you angry. Scoma's: In the heart of Fisherman's Wharf on Pier 47, Scoma's has been a popular destination for more than 30 years. It's located on a working pier and doesn't have much of a view, but online reviewers give it generally good ratings for quality of the food. Franciscan Crab Restaurant: If you're looking for a great view, this is the place to go. In fact, the view is probably why it gets overall high ratings. The service and quality of food are often mentioned as negatives. You'll find quite a few more restaurants than those two at Fisherman's Wharf. You can use Yelp, Open Table and Tripadvisor to find lists of them, just for starters. Here's the one thing you need to know, no matter what source you use: If you want to eat at Fisherman’s Wharf (the place where all the fishing boats are), check the map. Some places that show up in searches for Fisherman's Wharf are actually at Pier 39 or several blocks away from the wharf itself. When crab is in season (November through June), my favorite meal at the wharf is a loaf of sourdough bread from Boudin's and a fresh Dungeness crab from a sidewalk vendor, eaten on a dockside bench among the fishing boats. Ask the sidewalk vendor for "fresh" crab, and you'll get one cooked up just for you. These vendors also offer "take away" shrimp cocktails, calamari salad and other dishes. For a nice picnic, take your sidewalk purchases through the double doors between Alioto's and Fisherman's Grotto on Taylor Street, where you see the sign marked "Passage Way to the boats," and find a bench where you can sit and enjoy the scene. Beware of thow squawking seagulls who may want to share your lunch - or even worse, drop something white and stinky on you (if you know what I mean). Boudin's Sourdough: Visit the original Boudin (pronounced "bo-deen") shop on Jefferson for famous San Francisco sourdough bread to go or a meal in their restaurant. Their clam chowder in a sourdough bread bowl is tasty and has a local flair.